"Budgetary allocation for select environmental and land resources management and related programmes increased by 28.7% to J$10.4 billion for the Finiancial Year (FY) 2010/11. This was largely related to increased allocation for land resources management and environmental protection. Land resources received 53.6% of total allocation, a large portion of which was for the completion of the Montego Bay Convention Centre and improvement of sport and recreational facilities at GC Foster College in St. Catherine, Stadium East Practice Field and the simon Bolivar Cultural Centre in Kingston. 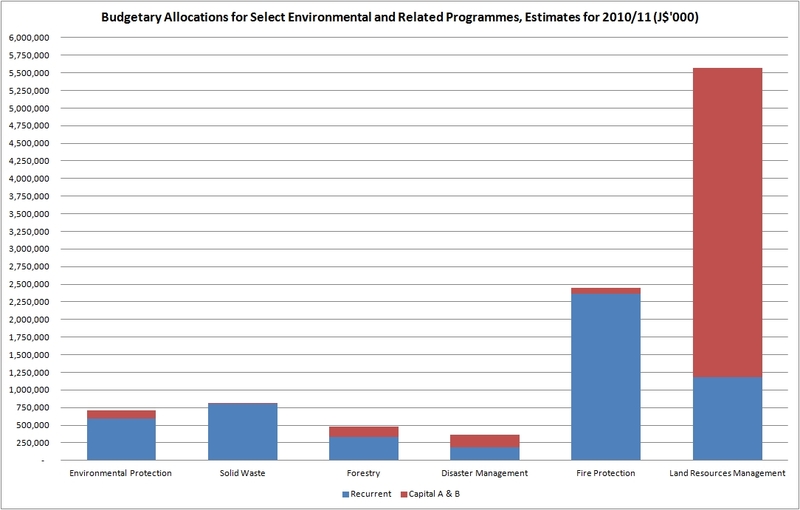 The allocations to SD (Sustainable Development) represented about 2% of the national budget."